Going back 25 years, overdrive was a highlighted feature on the Mustang. Starting in 1984, all Mustangs were finally equipped with an overdrive gear. Prior to that, select transmissions had it, but were only available if you wrote a larger check. It was a big deal to have overdrive back then, as it wasn’t an industry standard (it was something to separate a vehicle from the competition), but more importantly, it greatly increased fuel efficiency. Nowadays, you probably will not see ‘overdrive’ talked about (or advertised) to the extent it was back then. Why? Today, Ford has standardized this feature across their fleet, and due to this, overdrive is rarely ever highlighted as part of the vehicle’s feature list (it will still be in the brochure, but no longer a key feature like it was in the 80’s). However, this does not mean having an overdrive has lost its importance in the Mustang world! Like it did back then, overdrive gears give our beloved Pony cars some fuel efficiency. How exactly does it work? Let’s delve into it below, starting by explaining the concept of overdrive, and then continuing with the functionality of it between manual and automatic transmissions. As mentioned, overdrive is a feature of all modern transmissions that when used, decreases fuel consumption. The faster an engine spins the more fuel it will require. The faster a vehicle is moving, the faster the engine has to spin to propel it, right? Well, what if there is a way to decrease the engine RPM’s, but maintain overall vehicle speed? This would clearly lead to better gas mileage, and is exactly how an overdrive gear works. Essentially, an overdrive gear is a special gear that when engaged, rotates the output shaft of the transmission at a higher rate than the engine. For example, a driveshaft that is rotating at 2000 RPM whereas the engine is rotating at 1500 RPM is being overdriven by 33%, or a ratio of 0.67. All Mustangs produced with an overdrive transmission have had an overdrive ratio ranging between 0.625 and 0.725. Again, this means the engine is rotating at 62.%-72.5% (the specific ratio depends on the year and transmission in question, as overdrive ratios are non-variable) the speed of the output or driveshaft. So, say the ratio is 0.625 for this particular case, for every turn the driveshaft makes, the engine has only rotated 0.625 times. Conversely, for every rotation of the engine, the driveshaft is spinning ~1.38 times. By using overdrive, we have successfully lowered the engine RPM’s, thereby saving gas, but have maintained cruising speed. The way overdrive works in a manual transmission is actually very simple, it is just another gear installed inside the transmission, on the cluster, that when selected, has a gear ratio of less than one. To reiterate, the gear ratio is the ratio between input revolutions and output revolutions, measured relative to input. Thus, when reading a gear ratio of 2.95:1, it is to be interpreted as the engine spins 2.95 times for every 1 revolution of the transmission gear. Input speed is 2.95 revolutions, output speed is 1 revolution. When talking about overdrive gears, they will have a ratio of less than one (meaning output is faster than input). 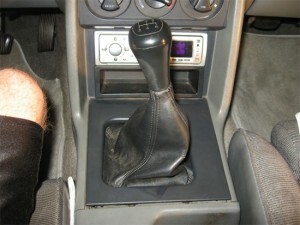 The highest gear available on your manual transmission will be the overdrive gear (either 5th gear or 6th gear). 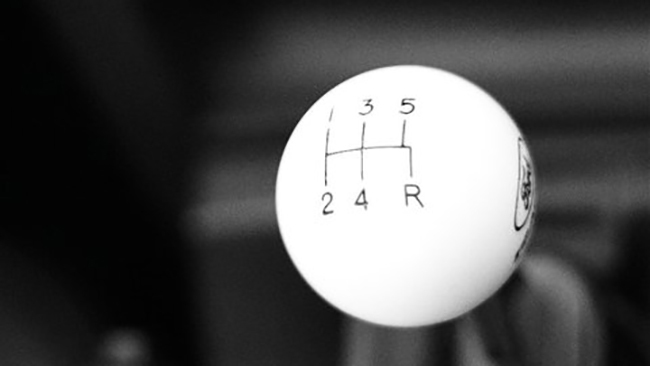 To engage overdrive, all you need to do is shift into the highest gear. Unfortunately, the way an automatic transmission uses overdrive is not quite as simply as a manual transmission, simply based on the fact that automatic transmissions are more complicated pieces themselves! An automatic transmission uses a torque converter to transmit power via the engine and transmission, whereas a manual transmission Mustang uses a direct clutch. Without diving too deep into the workings of a torque converter, a basic overview is probably needed. A torque converter is used to transmit power from the engine to the transmission, as mentioned above. However, the fashion it does so is completely different than a typical clutch setup. Torque converters rely on fluid couplings between two halves to transmit power. The impeller half is connected to the engine, whereas the turbine half is connected to the turbine shaft (which connects to the transmission). As the engine revs up, the impeller side spins (remember, impeller side is directly connected to engine), pushing transmission fluid (a special oil) over to the turbine side. Due to some very cool physics and engineering (which we will not discuss here), the turbine side rotates, which rotates the turbine shaft and subsequently turns the transmission. With that said, the good news is, it gets simpler from here. The important parts are: 1) impeller is connected to engine, and spins at same speed; 2) impeller pushes fluid to turbine side, which rotates turbine at a different speed. Wait a minute, this looks like the classic formula… input is greater than output, therefore the converter is slipping. When overdrive engages in an automatic transmission, it rectifies this converter slip by locking the converter (i.e: converter turns at engine speed) and then engages special planetary overdrive gears within the transmission. Having written all that, I suppose that overdrive within an automatic transmission does not work very differently than a manual transmission. The concept is the same – use a special gear that when driven, has greater revolutions than is applied. The complicating factor for automatic transmissions is the torque converter (the ‘middleman’). When should you use Overdrive? As often as you can! The more you can use overdrive, the more gas you can save. Automatic Mustangs will robotically manage this for you. When the conditions are right (vehicle speed and load), it will automatically engage. In fact, overdrive is enabled by default on automatic cars. There is a button to manually override it (usually near the shifter, or on the shift handle itself), but unless you are towing (with a Mustang?) or are travelling through very steep terrain, there is no benefit to disabling it. In fact, it will hurt fuel economy. The same applies to manual-shift cars. When cruising, use it as often as possible, when the circumstances dictate. Obviously, it will not be effective to cruise in overdrive at 30 MPH, but when approaching highway speeds, definitely shift into OD. If I perhaps was okay with a lot worse fuel economy so that I could keep my engine in higher RPMs to have more power readily available, will it hurt my torque converter? Basically, can overdrive be turned off all of the time without the heat in the TC damaging it? LOL using OD in the city just makes you use more fuel, I tested one week with OD and without OD, i can say i saved much more gas with OD off. Unless i drive faster than 60 i turn it on. Since the O/D button can be turned off, when would you want to turn O/D off? 2005 Ford Explorer SUV clicks off automatic 4 wheel drive overdrive unit at various times on the freeway while driving at 65 mph. It is a mystery why. Freeway speed use with light cargo load are drive conditions and best mpg efficiency is desired use over drive. Sometimes it clicks off on freeway grades, other times it has more recently clicked off on more level sections of freeway. Ambient temperature outside is about 97 degrees in Central Valley of California. Transmission was worked on about 4 years ago. Could speed sensor be heat damaged or age damaged after 10 years of use causing the sporadic “click off” of automatic over-drive with resulting dashboard amber light flash? Shutting off of the engine and restarting resets the overdrive unit until it clicks off again. Why does my 2000 mustang act like it is in neutral when it goes into overdrive. So it would be a good idea to cruise at 65 with the od light on the dash from Phx to LA ?